Founded in 1985, the Council of Canadians is Canada’s largest citizens’ organization, with members and chapters across the country. We work to protect Canadian independence by promoting progressive policies on peace, fair trade, energy, clean water and waste water, safe food, public health care, and other issues of social and economic concern to Canadians. Join & become a member on the national website (see below). 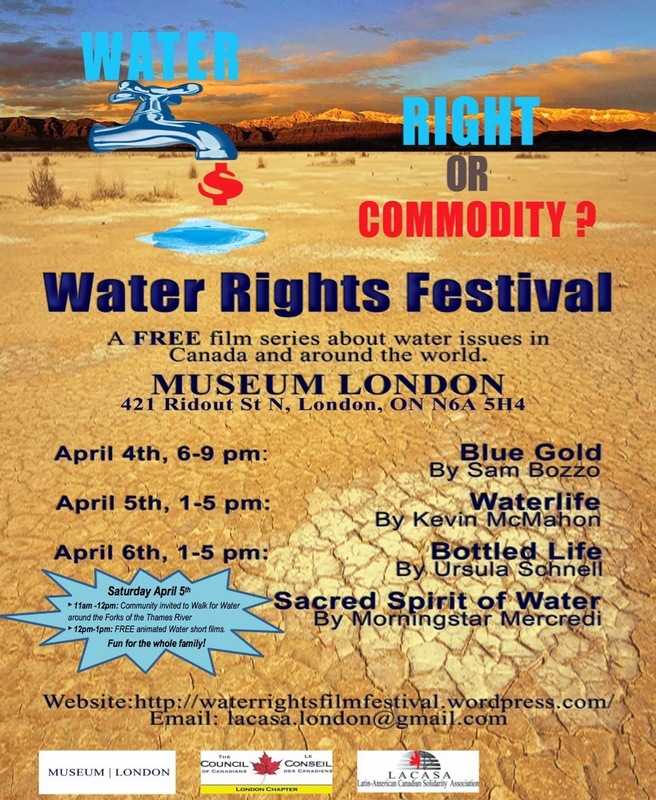 Water Rights Film Festival coming in April! April 4-6, 2014, Museum London, London, ON; more details will be provided soon! Note that you cannot join the local chapter. You can only join the national organization. If you want the local chapter to know about your membership, you must check the box for "Want my local chapter to contact me." when you send in your donation with the form on the national website (see below). "A RIVER RUNS THROUGH US": MAUDE BARLOW! Line 9 Snake goes to Toronto!